October is such a fun month! You may even agree that it's also the prettiest month of all. I just love the magic that October brings with all of the pretty leaves in bright beautiful colors. And of course, probably the Happiest thing about October is Halloween! 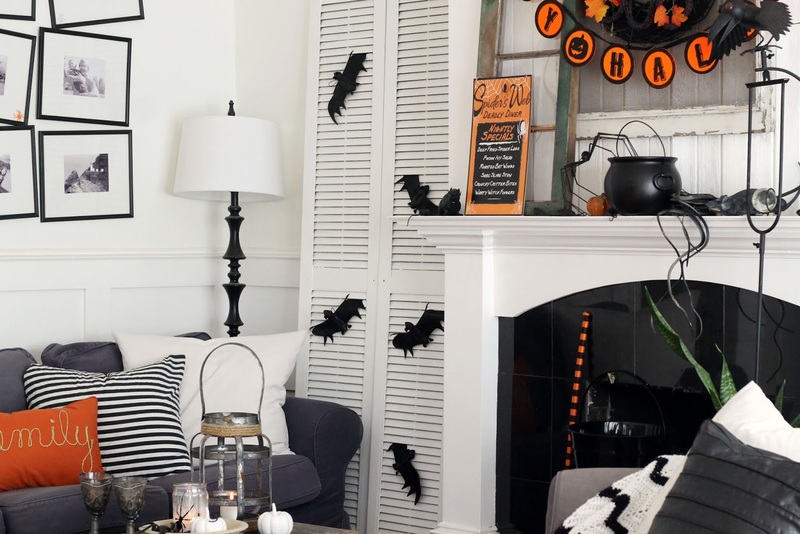 I had Way too much fun decorating our living room for Halloween and I can't wait to show it to you today! 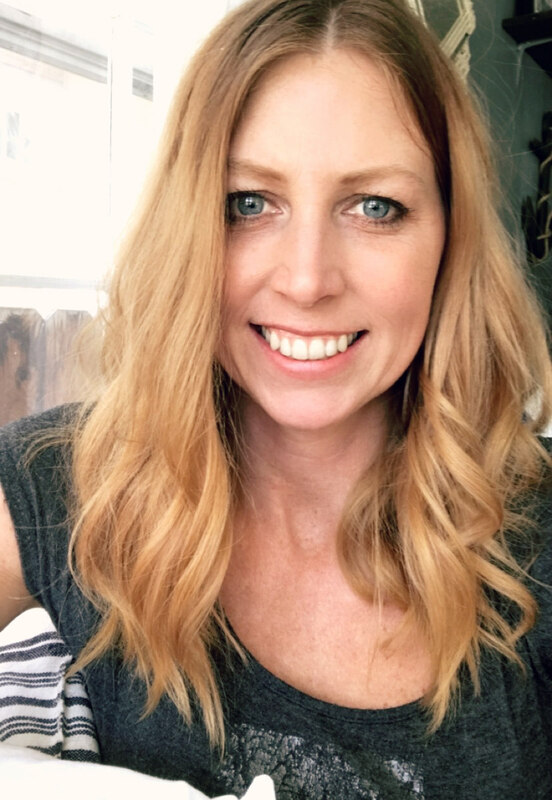 I'm also excited to be joining the lovely Kristen at Ella Claire along with a large group of super creative bloggers who are all sharing their Halloween decorating as well. This should be a really fun tour for you to take today full of lots of wonderful ideas. You can find all of the links at the end of this post. I stuck to a traditional Halloween color palette this year and incorporated lots of black, white, and Orange throughout our living room. I'm tickled with how our fireplace all came together this year. I pretty much added ALL of our Halloween decorations to it. I just kept layering more and more stuff to it and in the end I think it looks rather cheerful. These are all decorations I've collected over the years. The only thing that's new is the black plastic ball garland that I found at a yardsale this summer. 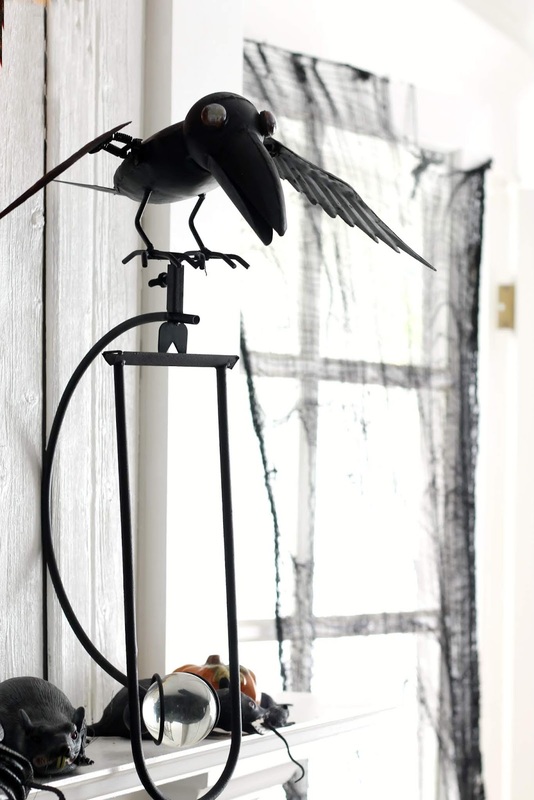 The black crow that hangs on a stand balanced by a glass orb is something we've had for years but it use to be a rust color. I just gave it a coat of black spray paint and brought it inside. I can't believe I hadn't thought to paint it before. It's so perfect for Halloween. I also whipped together this wreath. 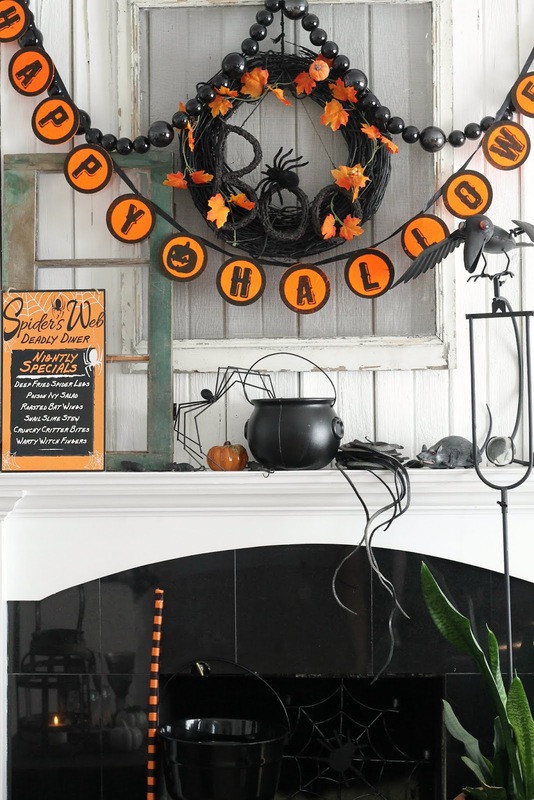 I spray painted an old grapevine wreath black and then I simply added an orange leaf garland to it along with a Boo sign and a large spider. My Halloween decorations involve a lot of spiders, snakes, bats and rats. What types of decorations are you drawn to? 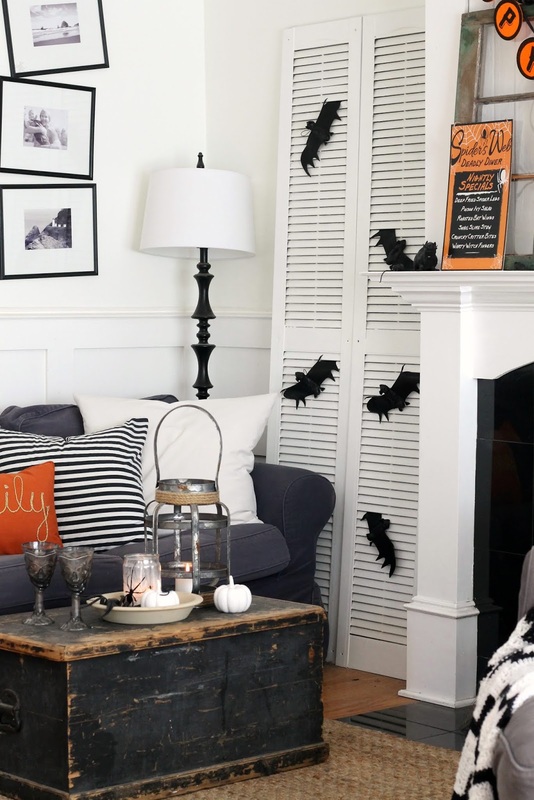 If you're not big on Halloween decorations then a couple of easy ways to add a fun touch to your home is to 1. slant your pictures that are already hanging on your walls. This is so simple to do and instantly adds a haunted-house feel. I've even tucked a few plastic bugs into the corners of my frames. You could also add some spider webs too if you want. 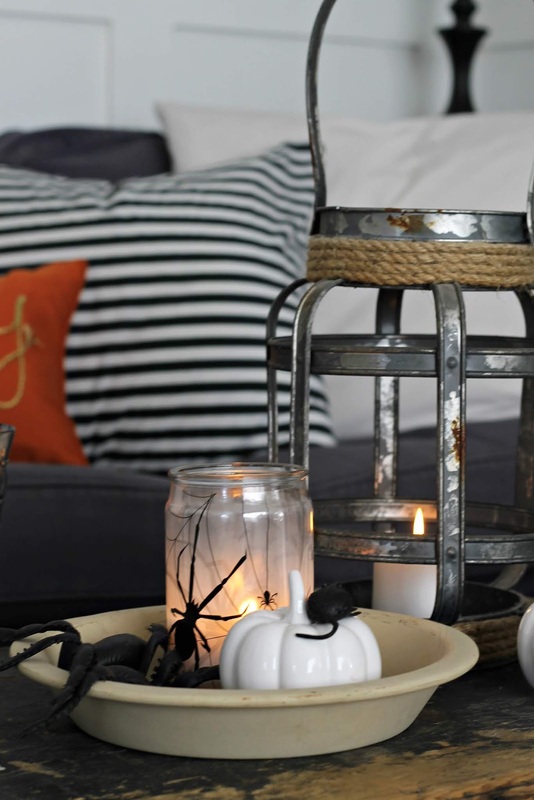 And 2. adding anything Orange is another no-fail way to add a touch of Halloween to a space. 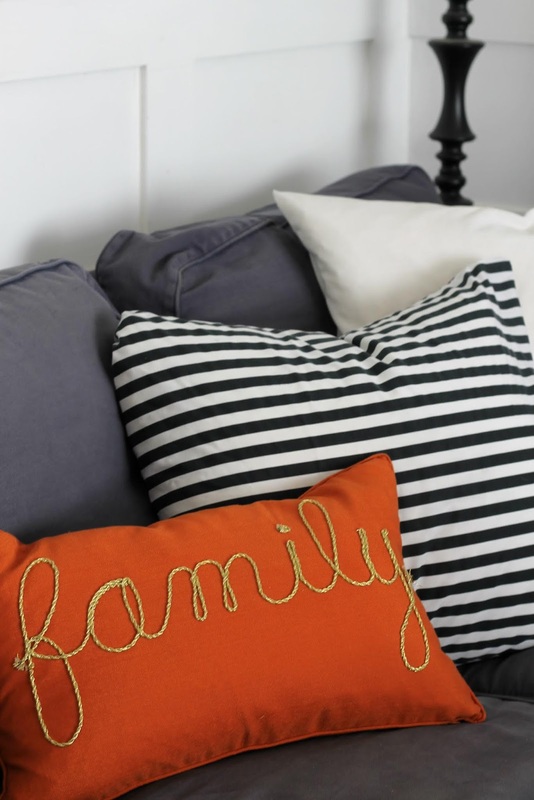 This orange pillow paired next to a black and white striped pillow definitely Screams Halloween. I also love to light candles this time of year. Candles have a way of making a space feel magical. 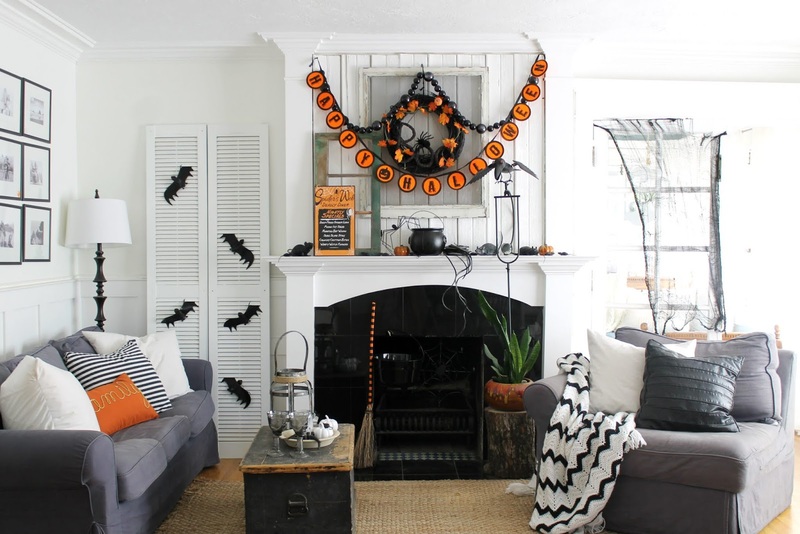 So what do you think of my black, white, and orange Halloween decorating in our living room? 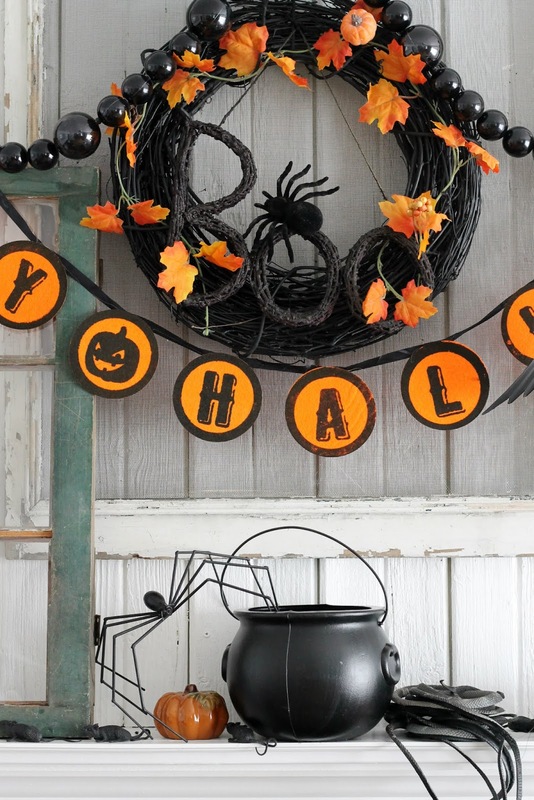 Want even more Halloween decorating ideas? Then be sure to Follow along on the tour! Emily, this is just darling....all of it!Black white and orange...so festive! i love the crooked photos and those little black crows are adorable. So cute! so happy to be on this halloween tour with you! I love your Halloween decor, it all looks so cool and fun! Especially love the frames! 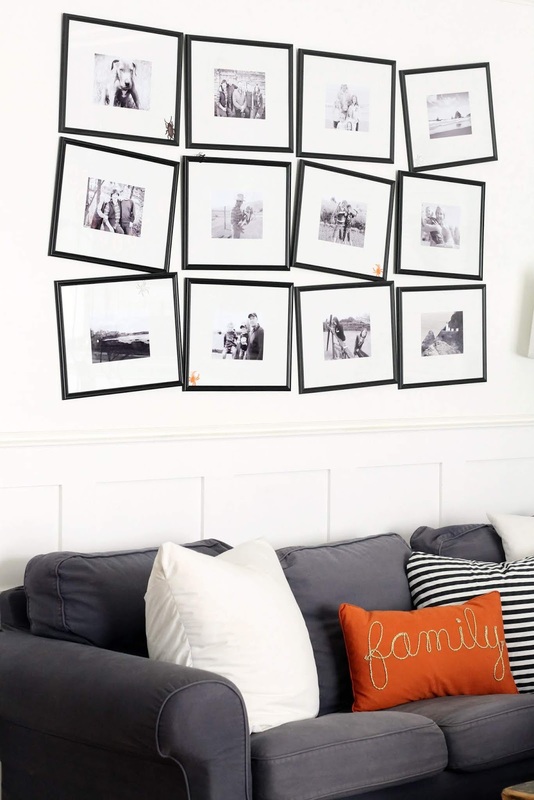 That crooked frame gallery wall is just too cute! So simple, but WOW! Love your traditional Halloween colors as well. So fun! Oh my gosh, this is amazing. 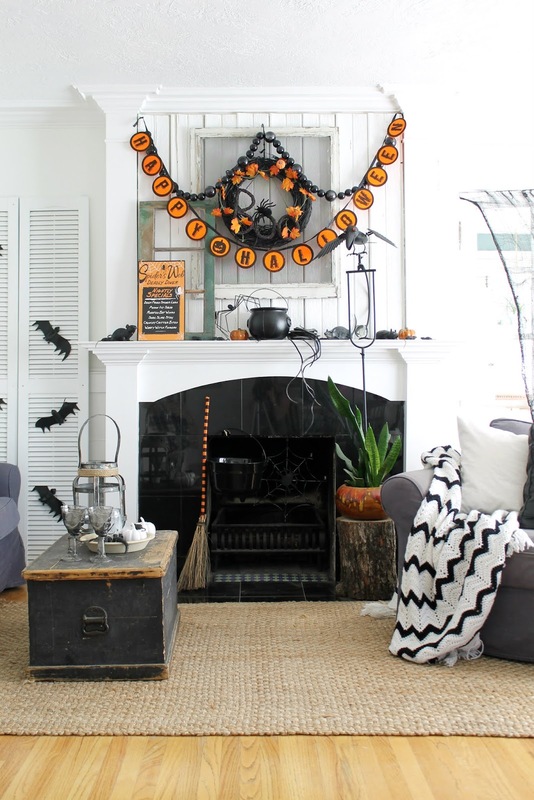 I love your crooked gallery wall and your fireplace is perfectly spooky! Emily, I love your crooked frame gallery with the little creepy bugs on them hehe such a fun spooky touch! So cute! I LOVE the crooked frames and your coffee table is so beautiful. 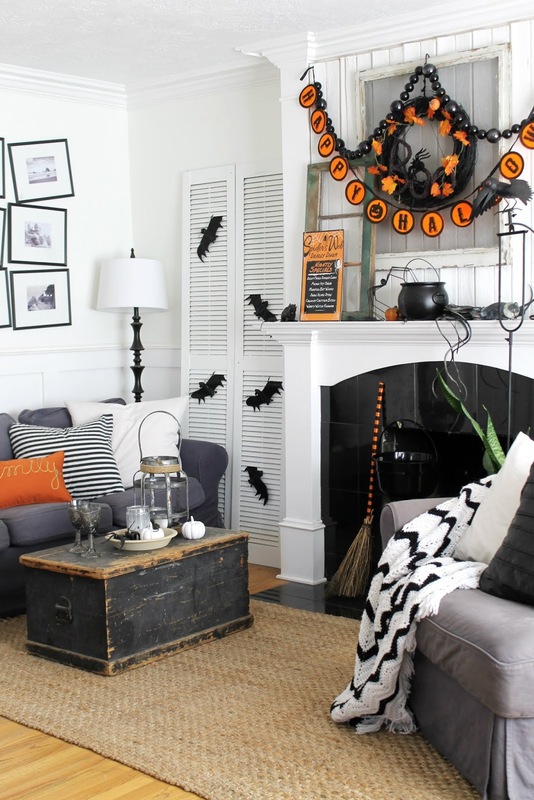 I love the touches of classic Halloween and especially the crooked picture frames! So good! By far my fave stop on the tour. I love, love, love that you went with the traditional Halloween colors! The crooked frames-spectacular! (a 'why didn't I think of that'). I love a good vintage feel to Halloween--wonderful job. Those crooked frames just make this room! It also looks so cozy!